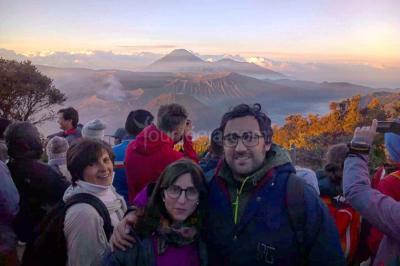 Ijen Bromo Tour are main tourist destination in east java. At Mt. Ijen you can see the biggest caldera with turquoise green acid water lake with the strong sulfur crystals porters, offering most spectacular panoramic mountain view of the active volcano. At Mt. Bromo you could see the very beautiful sunrise and panoramic view of Tengger Massif caldera in the Bromo-Tergger-Semeru National Park. Ijen - Bromo Tour 3D2N is tours package designed to enjoy Ijen crater lake, a large crater lake atop a active volcano and to enjoy Bromo Sunrise panoramic at Pananjakan, Sand Caldera and Mt. Bromo Crater. This tour package need Three days and two night duration. The tour started from Surabaya or Malang depend on the visitors arrival and spend 1 Night in Ijen Mountain area and 1 night in Bromo Mountain area. Tour to Mt. Ijen and Mt. 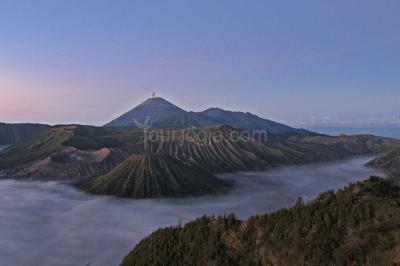 Bromo are very easy adventurous tour category, reachable from hotel by jeep 4x4 or local transport. We will pick you up on your arrival at Surabaya / Malang airport or hotel and transfer to your hotel in Bondowoso village then free and easy. Morning call at 3.30AM. We will depart max. at 4AM to Paltuding area, where the hike to Ijen crater rim would starts. The distance is about 3 km one way, and would take time about 4 - 5 hours return. Back to shelter and drive to Bromo directly. We will arrive in Bromo in the afternoon then free and easy. Wake up call at 03.00 and drive to a view point of Penanjakan (2.705m) by jeep to see a beautiful sunrise and the mount bromo landscape. Going down from the hill and proceed to the sand sea caldera. 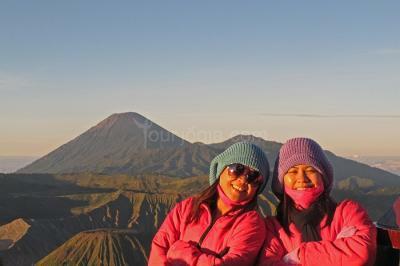 Then, you can climb up mount bromo by feet or pony. Back to hotel for breakfast and drive to Surabaya / Malang. Tour End.